A novel deceleration technique brings fast continuous beams of polyatomic polar molecules almost to a halt. The fast-growing research of cold polar molecules holds promise for delivering answers to many long-standing questions in fundamental physics, e.g., the existence of electric dipole moment of the electron, and for diverse future applications ranging from quantum simulations through quantum computation to controlled chemistry [1,2]. Producing abundant samples of cold polyatomic molecules from thermal ensembles, however, is a formidable challenge. A key step for obtaining cold molecules is the deceleration of molecular beams in analogy to atoms. Indeed, the stunning advances in atomic physics and quantum optics over the past three decades ensued to a great extend from the development of efficient laser cooling and deceleration techniques . Those methods heavily rely on closed cycling transitions between the electronic states in atoms, making possible multiple scattering of photons (~104) from a single atom, whereupon each scattered photon carries away a certain fraction of the atom’s kinetic energy, and this is how atoms are eventually decelerated and cooled. Compared to atoms, molecules are more complex objects and possess a more involved internal-energy structure: in addition to the electronic states, molecules have also vibrational and rotational states. For this reason, in general, closed cycling transitions are not possible for molecules, in particular for polyatomic ones, and hence the laser cooling and deceleration methods, which are the workhorses in atomic physics, are not applicable to molecules. The disadvantage of these two methods is that for most molecules of interest the typical height of electric or magnetic hills is of the order of 1 K, whereas molecules from typical sources, e.g., a liquid-nitrogen-cooled source , have initial kinetic energies of the order of 100 K. Hence, the molecules have to climb up a sequence of about hundred hills. This implicates that one has to apply this process many times in succession, which leads to operation in the pulsed regime. That is why molecules have been decelerated so far only in the pulsed mode, with a very low duty cycle. Thus the hitherto-implemented techniques [5-9] cannot make use of the intrinsically high flux delivered by the available continuous molecular sources. To utilize the full potential of such sources, a continuous deceleration is warranted. To achieve this, one has to provide a sufficiently high potential (~100 K) in order to decelerate molecules in one stretch. Such a high potential is provided by the gravitational field of the Earth, for instance. Simple calculations, however, show that for a molecule to be decelerated from around 200 ms-1 down to a trappable velocity of around 20 ms-1 it has to fly upwards in the gravitational field of the Earth for 2000 m, which renders such an experiment impossible or at least very demanding. The alternative is to artificially create an analogue of a gravitational field in the laboratory. In our group we exploit this concept: everyone who has been on a merry-go-round has experienced the outward force, which exists in a rotating frame. This force can be much larger than the gravitational force of the Earth, and is employed in centrifuges for a multitude of biological, chemical, medical and industrial applications. Now we employ a rotating frame for a conceptually different purpose, namely to decelerate a gas of neutral molecules from about 200 ms-1 to almost a standstill. Figure 1: Design of the centrifuge decelerator. Molecules are guided from the periphery to the centre of a rotating spiral-shaped quadrupole guide. As the molecules propagate they climb up a centrifugal potential hill and get slowed down, eventually approaching the exit of the centrifuge at a close-to-zero velocity. The 3D image in Fig. 1 shows the design of the centrifuge decelerator. The molecules are delivered from the source to the centrifuge through an electrostatic quadrupole guide (injector) composed of four parallel 2-mm-in-diameter electrodes with alternating polarity spaced one millimetre apart and arranged at the apices of a square (left lower corner of Fig. 1). The electric field of the quadrupole guide (Fig. 2) provides a transverse confinement for the guided molecules, which are trapped in the minimum of the electric field in the centre of the guide. The molecules are, however, free to move in the longitudinal direction and thus follow the guide. Once launched into the decelerator, the molecules propagate first around the periphery of the centrifuge in a stationary storage ring with a diameter of 40 cm composed of two static (Fig. 1, beige and green) and two rotating (Fig. 1, maroon and blue) electrodes. 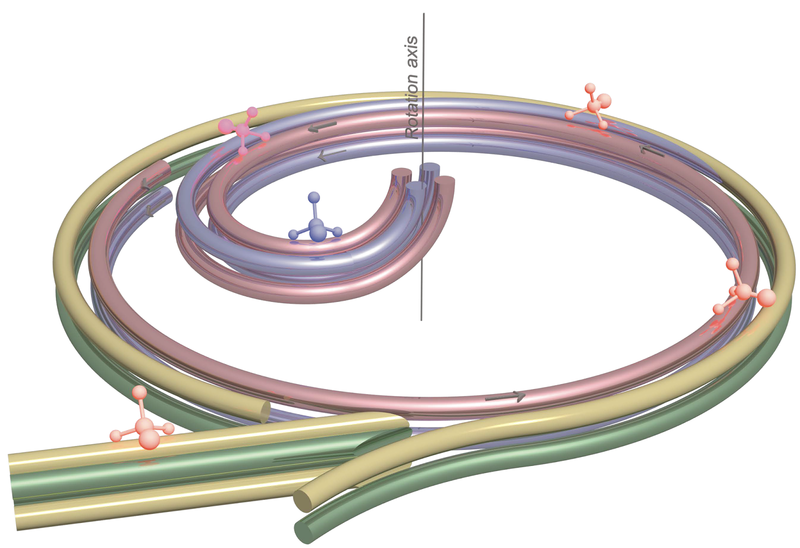 The electric field in the storage ring is the same as the one in the injector (see Fig. 2). Figure 2: Transverse electric field in a quadrupole guide. The x and y axes show the transverse dimensions of the guide. L and H on the right of the colour bar stand for low and high electric filed, respectively. Then, those of the molecules that move fast enough catch up with the entrance of a rotating spiral-shaped electrostatic quadrupole guide, and at this point they transit from the static into the rotating frame. The entrance of the rotating quadrupole guide is designed such that the outer two rotating electrodes are tapered and approach very closely, almost glide over at a distance of around 200 µm, the static electrodes of the stationary storage ring. The small gap between the tapered rotating electrodes and the static electrodes ensures a continuous electrostatic guiding potential, and hence a smooth transition for the molecules. The passage of the molecules from the laboratory into the rotating frame can take place almost at any point around the periphery of the centrifuge, which enables its operation in the continuous regime. Thus the centrifuge deceleration is a two-step process: the velocity of the molecules decreases first upon their transition from the laboratory into the rotating frame (because of the subtraction of the peripheral velocity of the centrifuge), and further, while propagating in the rotating guide, as they are forced to climb up a huge centrifugal potential hill, whereupon they are continuously slowed down by converting their initial kinetic energy into a centrifugal potential one, thus eventually reaching the rotation axis at a close-to-zero velocity. The decelerated molecules exit the centrifuge along its rotation axis through an exit bent quadrupole guide with a radius of curvature of 5 cm (see Fig. 1). Our group has demonstrated the capabilities and the universality of the new technique by deceleration of three species with different masses and a dipole moment of the order of 1.5 Dy, CH3F, CF3H, and CF3CCH. Fig. 3 shows the velocity distributions of the output molecular beams of CF3H for different rotation speeds of the centrifuge, and consequently, different centrifugal potentials. 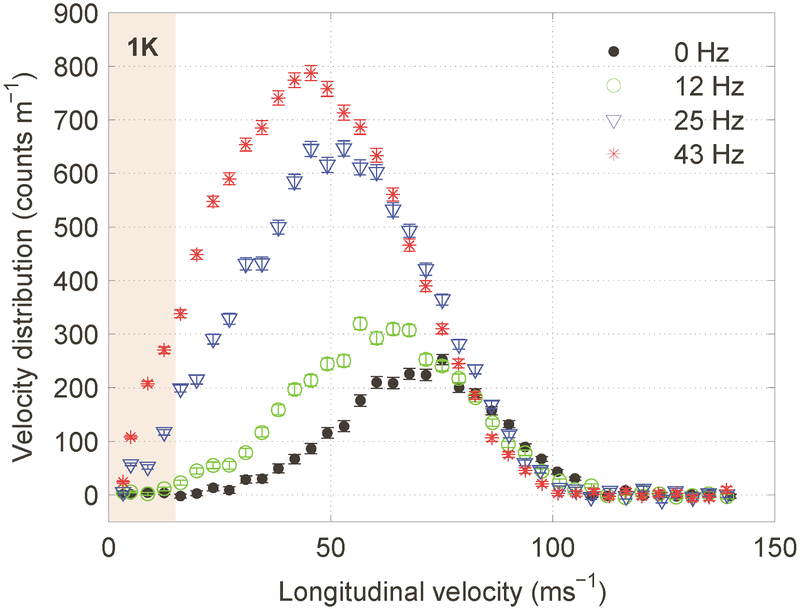 The deceleration effect clearly manifests itself in the shift of the velocity distributions to lower velocities with increasing the centrifuge rotation speed. In our experiments we can vary both the rotation speed of the spiral guide and the voltage at the quadrupole guide. For optimal conditions we achieved continuous output beams with intensities of several 109 mm-2s-1 for molecules with kinetic energies below 1 K (shaded area in Fig. 3). Combining the centrifuge decelerator with a hydrodynamically enhanced buffer-gas source [10,11] is expected to deliver even higher fluxes of slow and, in addition to that, internally cold molecules. Figure 3: Velocity distributions of the continuous output beam of CF3H molecules at a guide voltage of ±5 kV for different centrifuge rotation speeds. The range of velocities trappable in a 1-K-deep trap is shaded. Novel features of the centrifuge decelerator are its continuous operation, high output beam intensity, applicability to a large set of molecules, and ease of operation. Therefore it has the potential to become an extremely valuable method in the cold-molecule research. The universality of the centrifugal force might also enable one to slow down atoms that cannot be laser-cooled, and possibly even cold neutrons . Accumulation of centrifuge-decelerated molecules in an electric trap  and further cooling them via the recently demonstrated technique of Sisyphus cooling developed in our group at the MPQ  might allow for a dramatic increase of the phase-space density for controlled collision experiments with polyatomic molecules and pave the way to achieving quantum degenerate regimes with polar molecules. Lincoln D. Carr, David DeMille, Roman V. Krems, Jun Ye, “Cold and ultracold molecules: science, technology and applications”. New Journal of Physics, 11, 055049 (2009). Abstract. Debora S. Jin, Jun Ye (eds. ), “Introduction to ultracold molecules: New frontiers in quantum and chemical physics". Chemical Reviews, Special Issue, 112, 4801–4802 (2012). Abstract. Harold J. Metcalf, Peter van der Straten, “Laser Cooling and Trapping”. Springer, New York (1999). 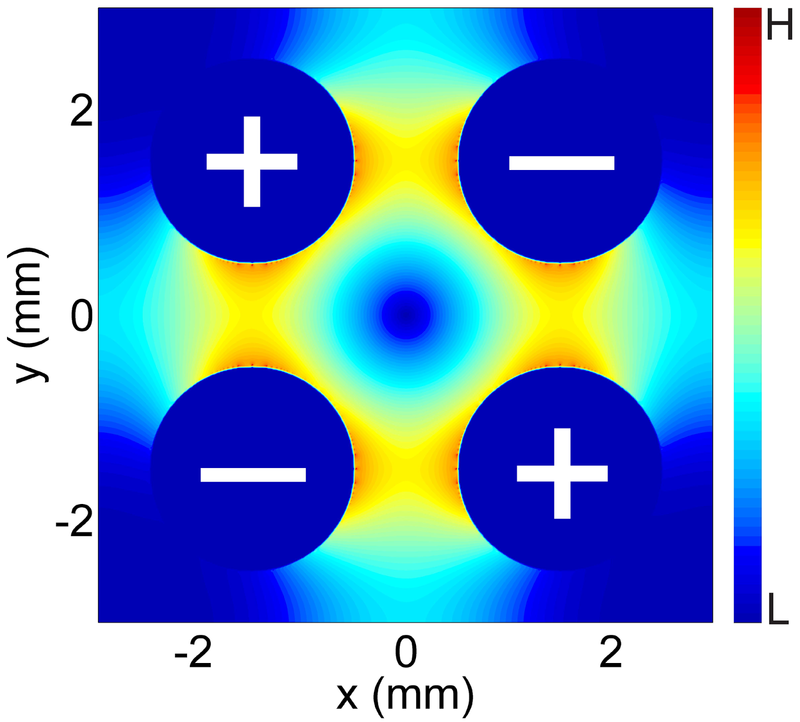 Tobias Junglen, Thomas Rieger, Sadiq A. Rangwala, Pepijn W. H. Pinkse, Gerherd Rempe, “Two-Dimensional Trapping of Dipolar Molecules in Time-Varying Electric Fields”. Physical Review Letters, 92, 223001 (2004). Abstract. Manish Gupta, Dudley Herschbach, “A Mechanical Means to Produce Intense Beams of Slow Molecules,” Journal of Physical Chemistry A, 103, 10670–10673 (1999). Abstract. Hendrick L. Bethlem, Giel Berden, Gerard Meijer, “Decelerating Neutral Dipolar Molecules”. Physical Review Letters, 83, 1558-1561 (1999). Abstract. R. Fulton, A. I. Bishop, P. F. Barker, “Optical Stark Decelerator for Molecules”. Physical Review Letters, 93, 243004 (2004). Abstract. Edvardas Narevicius, Adam Libson, Christian G. Parthey, Isaac Chavez, Julia Narevicius, Uzi Even, Mark G. Raizen, “Stopping Supersonic Beams with a Series of Pulsed Electromagnetic Coils: An Atomic Coilgun”. Physical Review Letters, 100, 093003 (2008). Abstract. S. D. Hogan, C. Seiler, F. Merkt, “Rydberg-state-enabled deceleration and trapping of cold molecules”. Physical Review Letters, 103, 123001 (2009). Abstract. Christian Sommer, Laurens D. van Buuren, Michael Motsch, Sebastian Pohle, Josef Bayerl, Pepijn W. H. Pinkse, Gerhard Rempe, “Continuous guided beams of slow and internally cold polar molecules”. Faraday Discussions, 142, 203 (2009). Abstract. Nicholas R. Hutzler, Maxwell F. Parsons, Yulia V. Gurevich, Paul W. Hess, Elizabeth Petrik, Ben Spaun, Amar C. Vutha, David DeMille, Gerald Gabrielse, John M. Doyle, “A cryogenic beam of refractory, chemically reactive molecules with expansion cooling”. Physical Chemistry Chemical Physics, 13, 18976–18985 (2011). Abstract. C. M. Lavelle, C.-Y. 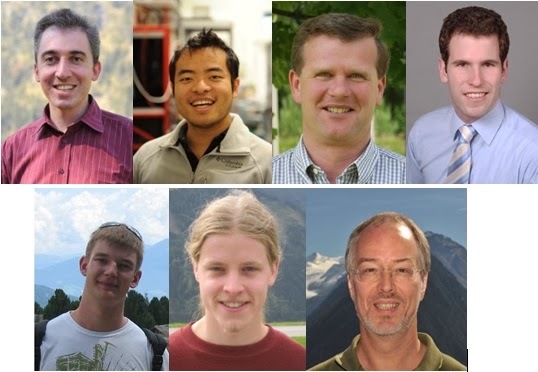 Liu, W. Fox, G. Manus, P. M. McChesney, D. J. Salvat, Y. Shin, M. Makela, C. Morris, A. Saunders, A. Couture, A. R. Young, “Ultracold-neutron production in a pulsed-neutron beam line”. Physical Review C, 82, 015502 (2010). Abstract. B. G. U. Englert, M. Mielenz, C. Sommer, J. Bayerl, M. Motsch, P. W. H. Pinkse, G. Rempe, M. Zeppenfeld, “Storage and adiabatic cooling of polar molecules in a microstructured trap”. Physical Review Letters, 107, 263003 (2011). Abstract. Martin Zeppenfeld, Barbara G. U. Englert, Rosa Glöckner, Alexander Prehn, Manuel Mielenz, Christian Sommer, Laurens D. van Buuren, Michael Motsch, Gerherd Rempe, “Sisyphus cooling of electrically trapped polyatomic molecules”. Nature, 491, 570–573 (2012). Abstract.